On a December day in the Cambrian Mountains, when the grass crackles underfoot and every breath billows mist into the air, imagine a flash of pure white, spectral in the greying light of a winter’s afternoon— a mountain hare leaping from the shadows to frisk beneath the pewter moonlight. The mountain hare (Lepus timidus), a native species that sheds its brown summer coat to a cloak of pure white between October and January, is sadly now a ghost, a mere memory to our Welsh landscape. There are a handful of populations left in Britain: in Scotland, Derbyshire, The Isle of Man and Northern Ireland, but these are reported to be in decline. 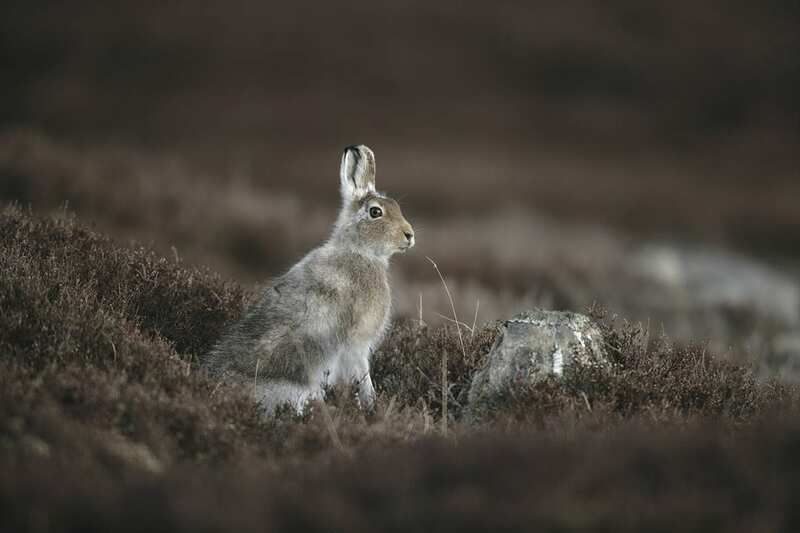 Whilst the more common brown hare was most likely introduced to Britain 2000 years ago, mountain hare remains found in the UK have been dated between 144,000 and 131,000 years old. Smaller and more compact than the brown hare, their body length ranges between 45-65 centimetres. They are various shades of brown when in their summer pelage, with a grey/bluish tint that gives them their other name— the blue hare. Their tails are white all year round, and their ears are tipped black. Less pernickety about food than their European cousins, mountain hares have the competitive edge over the brown hare in mountainous regions and will feed on gorse, willow, rowan and juniper where forage is scarce. Elsewhere, however, brown hares have displaced mountain hares, confining them to upland regions. In Scotland, mountain hares are shot for sport. They can carry a tick-born virus that can kill grouse chicks, thus are perceived to compromise the grouse shooting industry, prompting wide-scale culling despite their tenuous conservation status. Reintroduced to Snowdonia in the late 1800’s for sport, the Welsh mountain hare population has since died out. A modern reintroduction programme holds potential as the breeding season, beginning in January, continues throughout the year producing up to four litters, so populations can recover quickly. Further threats to mountain hares include habitat loss and fragmentation and predators such as foxes, stoats, birds and cats. Leverets are particularly at risk. Global warming could also be a factor of their low distribution. Their winter coats, helpful camouflage when the cold months invariably brought snow, are a hindrance in our recent, temperate winters. Pagan, Saxon and Druid symbolism is rife with depictions of the hare. Ēostre, a spring time goddess who is the namesake of Easter, is often depicted with hares, as they represent rebirth, fertility and the return of summer fruitfulness. The modern concept of the Easter bunny harks back to this animal’s ancient association with the spring festival, when Ēostre emerges from the cold depths of winter to frolic with hares, bringing the budding promise of spring. Witches have a folkloric reputation of shape-shifting into hares. Local to Ceredigion, the tale of Mari Berllan Bitter tells of a 19th century girl from near Aberarth with a reputation for witchcraft. She could utter spells to prevent butter from churning, curse farmers so they lost their cattle and, as legend has it, turn into a hare. In the Mabinogion, Gwion transforms into a hare to escape the wrath of the enchantress Ceridwen. Outsmarting him, she transforms to a greyhound. He retaliates by becoming a grain of corn, but Ceridwen eats him, the grain causing her to become pregnant with Taliesin, who grew up to become the legendary Welsh bard.